What a year is has been for fly fishing in Montana. We are lucky to get to spend our time on the water surrounded by so many great people, and I was to start off by giving a big thank you to all of the anglers that chose to fish with us, the guides that show up to work hard every day, and all of the shuttle drivers, lunch providers, and fly shops that work hard behind the scenes to make guided fly fishing in Montana so great. Thank You! As the first snow hits the ground and the season starts to wind down we want to take an opportunity to reflect on 2018, share a few stories, and look ahead to what the future holds. It really was a great year to be a fly fishing angler and guide in Montana. Winter 2018 provided more than enough snow to keep our rivers running high and cold all summer, which made for lots of happy trout and happy anglers. 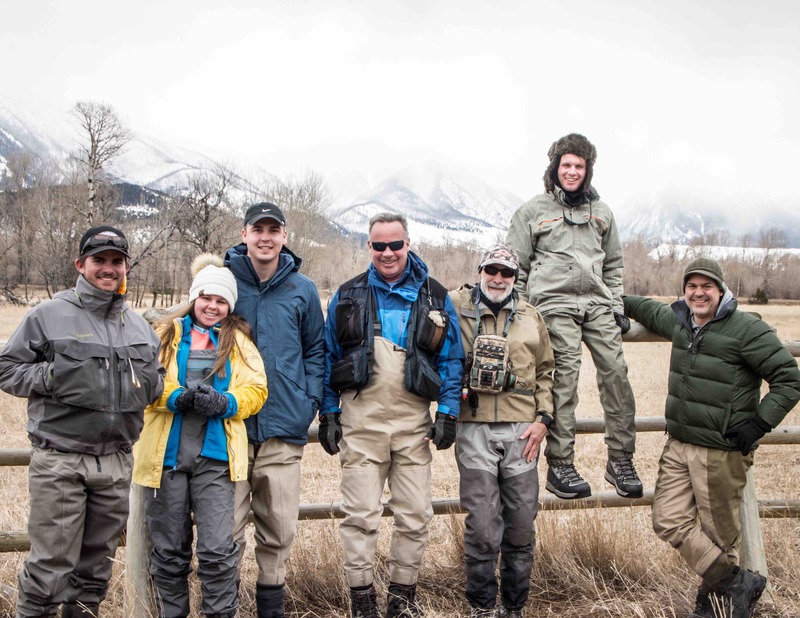 The season started off strong with as nice of weather as you could have asked for in March, April, and May which made for great fly fishing all around Bozeman, MT. The Paradise Valley Spring Creeks showed off for anglers early in the spring, and the Missouri River spoiled anglers and guides on a daily basis all through the month of May despite higher than average flows. Big water came to all of our rivers and we saw truly record flows on the Yellowstone River, Dearborn River, and parts of the Missouri River. The Madison River received enough inflow for a solid week of flushing flows. While these high and at times dangerous flows kept our anglers off some of these waters later than normal, it made for great fly fishing all through August and September. Some of the best dry fly fishing we’ve ever seen in Montana. Seemed like you could just pick a hopper, any hopper, and you we’re set to go. Historically, great spawns follow high flows, as a result of new gravel opening. Hoping to see an increase in trout per mile on many of our rivers in the coming years. By late June the salmonflies started to pop on the Madison River and our other rivers closer to home and we put away our bobbers until October. The dry fly fishing on the Madison River, Yellowstone River, the many rivers of Yellowstone National Park, and other local freestones, was consistently spectacular. Made me feel bad for the few anglers out there nymphing. The quality of hopper fishing in particular deserves special note. From late July through late September, you could have fished a single hopper on the Yellowstone River, Madison River, and Missouri River and expected to do well. Sure some days were better than others. But all was good. Hard to say what had the wanting the hopper so bad. Didn’t seem to be more hoppers than usual. Farmers all cut their hay same as always. Who knows. What I do know is I just about filled up my phone memory with pictures of big cutthroat, rainbow, and brown trout with hoppers hanging out of their mouths. September brought cold weather but good fishing. The Yellowstone and Madison Rivers continued to fish well for our anglers and fly fishing guides. But the Missouri River gave it up. I got to spend most of mid-September through late October on the Missouri River guiding anglers. About the most fun I’ve had guiding. The nymphing on the upper river was phenomenal but the dry fly fishing from Craig downstream to Cascade was the real deal. Lots of sight fishing opportunities to bigger-than-your-average trout and the blind dry fly fishing was as good as it gets. BWOs, caddisflies, callibaetis, midges, and terrestrials all accounted for their fair share of caught fish. Looking forward already to doing it again next year. Overall I would give 2018 5-stars. Lots of happy anglers. Great dry fly fishing. No one fell (all the way) out the boat. I was hooked less than 5 times. Got to fish and guide a bunch of different waters. Got to be a part of a bunch of anglers’ best day ever. 2018 really was a great one and I’m looking forward to doing it again in 2019 already. While we may still have a few more trips to go in November, things are starting to quiet down on our local waters in Bozeman, MT as winter has started to set in. We’ll be spending more time talking about fly fishing and booking trips than on the water actually fishing in the coming months. But March will be here before you know it, and we’ll be back out on the water soon enough. Primetime dates for 2019 are already starting to book up quick. Never too early to start planning your next Montana fly fishing trip. We’re hoping to add the Blackfoot River to our trip options for next year based out of Craig, MT. Other new news will be coming this winter. Stay tuned. Thank you again for everything in 2018 and here’s to a great 2019!